The Strange Case of Dr Jekyll and Mr Hyde is one of the most famous books penned by Robert Louis Stevenson towards the end of the 19th century; it concerns the split personality of the eponymous characters and the evil that afflicts one of them. Microgaming have picked up the notorious story and converted it into an online slot machine complete with relevant characters and images and atmospheric music. There are five reels and 1024 paylines which means that as long as there are winning symbols from left to right on the reels, you have a win. The basic symbols are 9, 10, J, Q, K and A but the special symbols are all theme-related with Dr. Jekyll’s potion, poison, the female interest, a wild symbol, Dr. Jekyll and the Jekyll and Hyde logo. The Jekyll and Hyde logo is the scatter symbol. There’s just one bonus game here and you can trigger it by landing three or more scatter symbols anywhere on the reels; you will then be awarded ten free spins during which it’s possible to get more spins by landing three more scatters. The creative feature of this bonus game is that while you are playing, all Dr. Jekyll symbols will turn into Mr. Hyde ones. If you can land a winning combo featuring three, four or five of these symbols then you can win 500, 3750 and 7500 coins respectively, far higher wins than are available in standard gameplay. 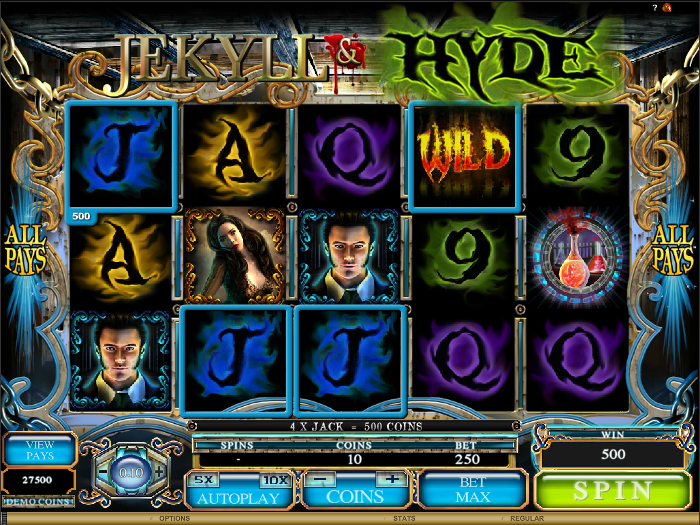 Jekyll and Hyde is a great looking game with some fantastic graphics; we’d perhaps like a little more in the way of bonus games but the Jekyll and Hyde symbol swapping is a nice innovation which can pay out in a big way. An expert mode enables the player to choose options such as the number of Autoplay spins and as paylines are fixed, your betting range is limited to between €0.01 up to €250.00.